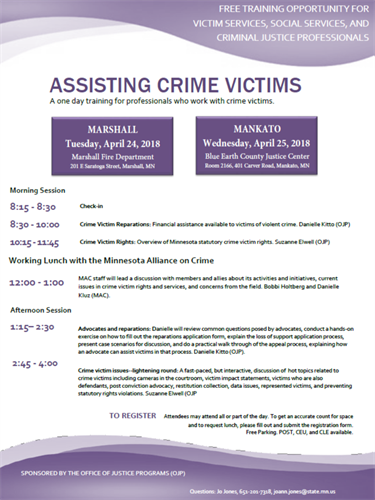 A one day training for professionals that work with victims of crime. This is a free training opportunities for victim services, social services, and criminal justice professionals. Attendees may attend all day or choose between morning and afternoon session. Morning Session 8:15 a.m. to 11:45 a.m. Working Lunch 12:00 p.m. to 1:00 p.m. Afternoon Session 1:15 p.m. to 2:45 to 4:00 p.m.